CD-adapco announced Prague as the location of the STAR Global Conference 2016 on 7-9 March. Deadline for presentation abstracts is 30 November 2015 with acceptance notifications sent in December 2015 or January 2016. In other CD-adapco news, their 2016 Calendar Contest is accepting entries through 31 August and you might win an Apple Watch. ANSYS 16.2 was released and includes many upgrades to Fluent’s meshing and CAD handling. Read about how Femap is used by PaxOcean to mesh and preprocess complex marine and offshore geometries for simulation. Disney shares their work on OmniAD for modeling the aerodynamics of rigid objects using spherical harmonics. Wellscope is a new CFD-based process for modeling a well and near-wellbore. Image from Offshore Engineer. Click image for article. Speaking of Onshape, download their Instructor Kit to begin teaching Onshape to your students. Are you planning on buying a new computer workstation for CAD and CAE? Desktop Engineering’s Answers to Your Workstation Questions might help. Tech Clarity wants to know how you use simulation to develop more competitive products. Take their CAE Survey. Symscape’s August 2015 newsletter includes responses to common questions about Caedium and the company’s business model. AIAA provides nice summaries of events from Propulsion and Energy 2015 including one on how CFD and experimental researchers must work together. New [to me] CFD blog: Navier-Stokes Waves and Structures, exploring the physics behind turbulent flows. ParaView 4.4.0 will be released “in the next month or so” and includes a new color map that’s more amenable to those with color blindness and an interactive point and selection mode. Here’s the best of the visualization web for June 2015 from Visualizing Data. The Khronos Group announced updated standards for Open GL ES 3.2 for graphics on embedded devices and Vulkan for graphics on GPUs. You can read about SimBest, a project designed to collect and share simulation and modeling best practices. SimBest targets small and mid-sized enterprises and hopes expand their use of simulation. The project’s final report is due in March 2016. I’ve recently become aware of Benefunder, an online site that connects philanthropists with researchers. For example, several professors at my alma mater are promoting their research on the site including Dr. Melissa Green’s work on drag and vortices. How Much More Grid Could This Be? The answer is none. None more grid. They both contain quadrilateral cells. They both contain multiple zones or blocks (i.e. the panels serve as a domain decomposition). 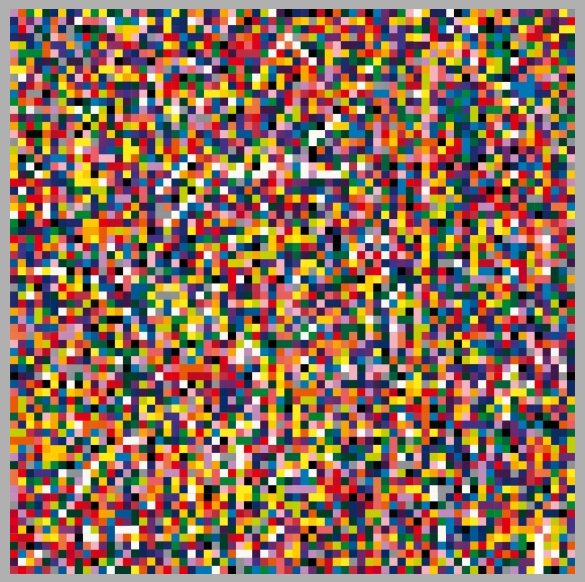 The colors of the squares and their arrangement were randomly chosen by a computer program (i.e. programming is involved). Gerhard Richter, 4900 Colours, 2007. Image from the artist’s website. See link above. This entry was posted in Applications, Events, Hardware, News, Software and tagged ANSYS, Caedium, CD-adapco, Femap, Khronos, OmniAD, Onshape, OpenGL, SimBest, Symscape, visualization. Bookmark the permalink.